my discussion with Maria Parkes brought back so many names: Elmer Novotny Jon Kitner Greg Harrison Bob Wick. she sd that she studied jewelrymaking with the wonderful Mary Ann Scherr. that made me remember this photograph. I think Doug Moore took it outside Merrill Hall. that ring was a Scherr creation. it had my first name as part of the design. what you see is the "e." & I recall ever so fondly that suit. it was brown with black pin stripes. I bought it on 8th St in the Village. long after it had gone out of style I kept it in a closet & finally donated it to Kent State's costume museum. in fact before I moved west I also donatd the Scherr ring. it wd be a hoot to see them exhibitd together there with this photo some day. I bought this painting in 1968 for $50. it was part of the Kent State masters thesis exhibition of Michael Parkes. currently it hangs in my bedroom so I see it everyday. for most of the nearly 40 years I've lived with this painting I didn't know what had become of its creator. Michael drove into Kent on a motorcycle wow'd the ladies & made some good paintings then disappeard. 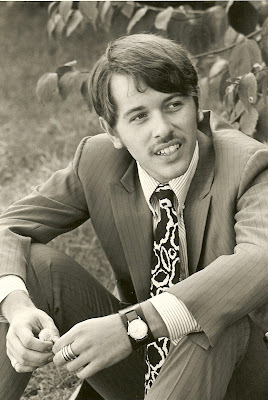 then some years ago Alicia Metcalf Miller gave me an article abt him in one of those expensive design mags. it sd he lived in Spain & was the world's most famous Magic Realist. yesterday he had an opening right here in town & I went. I remind'd him of the painting which he didn't remember. I also suggestd that I probably was the first person to publish him. his seriograph "Six" (which is now on the wall of my guest room) appeard in the Winter 1968 issue of Toucan. it depicts a naked lady riding some sort of beast. Michael sat down to sign posters & books. so I startd a conversation with his beautiful wife Maria. 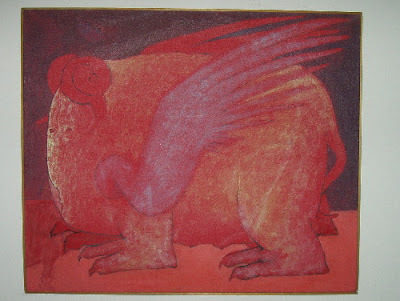 turns out they met in Kent where she was the roommate of printmaker Peggy Freemon (whose work also appeard in Toucan). as I steppd back so that others cd chat with her a woman in red came up. I cd see from a distance that they were having quite the lively discussion. in a bit they both came over to me. Maria sd that when they returnd to the States for openings they never encounter people from their Kent past. but this time there were 2. it turns out that the woman in red was a local artist by the name of Dona Calles. & that she'd been Michael's girlfriend before Maria. quite the show last evening. I don't recall ever having seen a rainbow at 8:30 at nite nor have I seen a rainbow & lightning share the same sky. later I settld on the blue swing wrappd in my Lorain County throw & enjoyd a long & spectacular light show. so I'm watching "Bride of the Gorilla"
it's a fun film. its star isn't much of an actress but Barbara Payton is a looker. & if you know her short sad history yr mind will wander. it's been sd that her dressing room saw more action than was capturd by the camera. apparently she was boffing co-star Tom Conway on days when she wasn't juggling Franchot Tone & Tom Neal. & in the cast is a tall hot handsome man by the name of Woody Strode with whom she also had an affair. scuttlebutt is that a biopic is in the works. her story lends itself to either tragedy of Greek proportion or melodrama as sleazy as the headlines on celebrity news shows. I can't wait. I have this awful feeling that as diastrous as the Iraq war is that the real legacy of shame from this administration will be the Roberts Court. in my copy of that legendary book I wrote my name & the date "jan 68." Tom Kryss thinks I may have a "pre-publication copy." & I suspect d.a. levy may have given me my copy when he visitd Kent that month. there were 1000 copies printd & it's become a scare item. but there's good news. Russell Salamon just brought out a facsimile edition of 400. it's as identical to the original as one cd have. & he's add'd some bibliographical information & glossary. this is a must purchase for anyone interestd in levy or '60s underground lit or Cleveland. to get yr copy write to Russell at "thesalamons@earthlink.net." 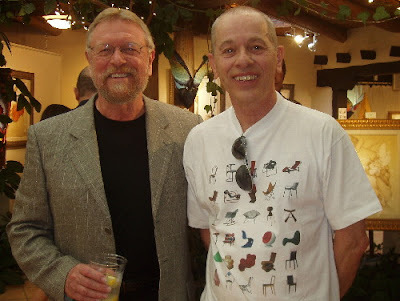 before he left John told me I had to blog abt "La Vie En Rose." we saw it this afternoon at the college. it's a beautiful film. go see it. John Grimes is visiting from Boston. 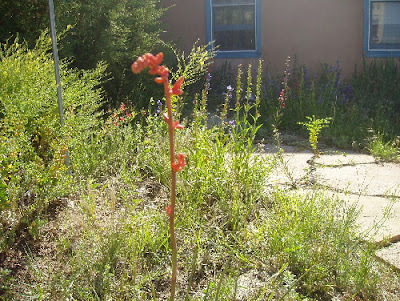 we spent the day in Taos. 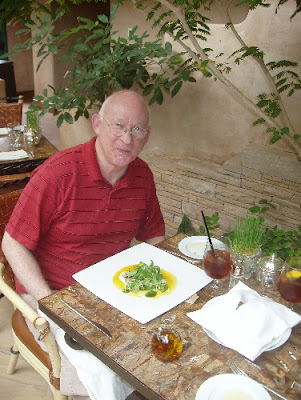 here he's with an elegant salad at El Monte Sagrado. after writing the last entry I rememberd an article which appeard in the Elyria paper many years ago. I was able to locate it in my files & was abt to post it here when I got an e from his daughter Judith. she wrote "I have been going through dad's files looking for clippings and photos for a memory board. 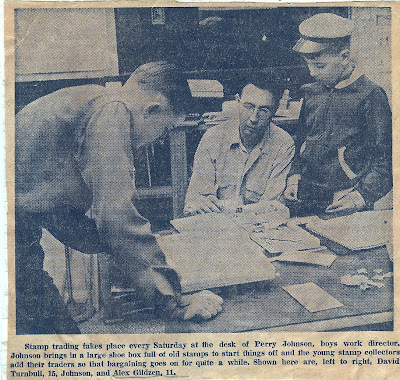 One of the few I found in his desk is a CT article about his work with boys who collect stamps. You are standing next to him in the photo, at age 11." I love those moments of synchronicity. Mom calld early this morning to tell me of the death of Mr. Johnson. 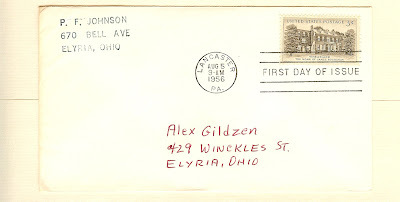 I like that he used his return address & wrote my address by hand. a lovely linking. in fact the last time I saw his daughter Judith I gaver her one of those old first day covers as a souvenir of that priceless time of my life. & in summers Mr. Johnson workd at Camp Iss See Kes. going to this Y camp was a highlight of my pre-teen summers. somewhere I still have a set of nature prints I did under his tutelage. I hope there are still Mr. Johnsons out there opening worlds up to the young. yes it was dinner with Todd Moore. sometime during a visit from him the talk always turns to murder. he's the author of Dillinger with a new book coming out on Billy the Kid. & I have a fascination with the Black Dahlia case. tonite we discussd why certain murders are more compelling than others. 2 of the most important elements are if the victim is young & attractive (Elizabeth Short or JFK) or if the case remains unsolvd (the Jack the Ripper murders & again the Black Dahlia). 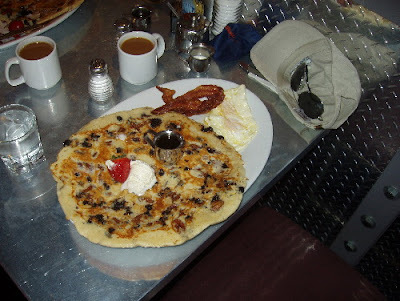 somewhere between Bellagio Buffet & Hash House A GoGo I began to resemble Rosie O'Donnell so it was good to work out again this morning. & now excuse me while I prepare a salad . . .
on the edge of Death Valley an old woman lives alone in a rambling house full of her paintings. the only sounds are the cackles of peacocks who reside in a series of abandonnd adobe buildings nearby. the woman walks the short walk to Amargosa Opera House. the walls are coverd with her paintings. for years the woman has been putting on costumes she makes herself to perform a show of her creation for people who come from all over the world just to see her. Marta Becket is a legend. her age is a secret (altho we do know that she first appeard on Broadway in 1946). a recent fall has slowd her but she still can kick. I first saw Marta perform in Death Valley Junction in 1983. my old friend Tom & I joind Garold Gardner & some of his dancer friends for the trip. 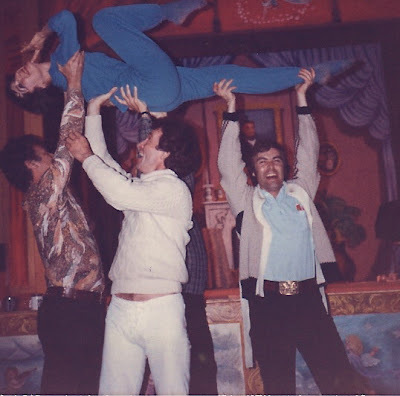 here Lloyd Pauze & some of "the boys" lift her. a year or so ago a prize-winning documentary abt Marta made me want to see her again. 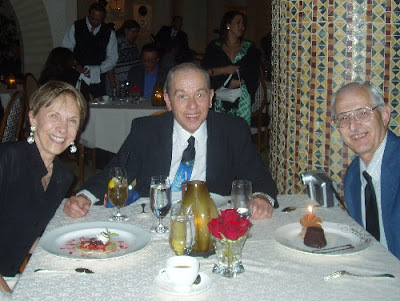 my old friend Tom is dead but Garold still lives in Las Vegas & visits Marta. so Sal & Regina & I drove out to the desert where we found her kicking indeed. Frank Piper -- who lives in nearby Pahrump -- joind us & after a tour of the opera house we were off to a casino in Amargosa Valley Junction for dinner. even there several of Marta's fans stoppd by the table to wish her well. if you haven't seen the film look for it. Marta Becket deserves to be calld a legend. Darryl has already coverd the nite. let me just add how smitten I was with Dresden Dolls. they were the only performers who made themselves available to fans by appearing at a table to meet & greet. 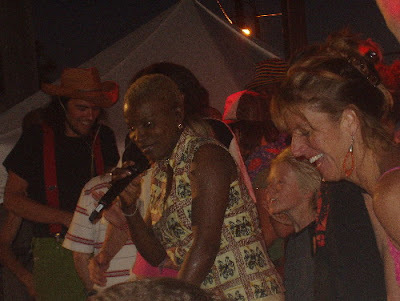 they were followd on stage by Indigo Girls who were less than thrilling so I slippd out to get a close-up of the pair. Brian was sitting there in nothing but shorts & make-up. I look forward to years of enjoyment from these 2.
my cousin turns 60 in a few days. so Regina & I are treating him to a week in Las Vegas. 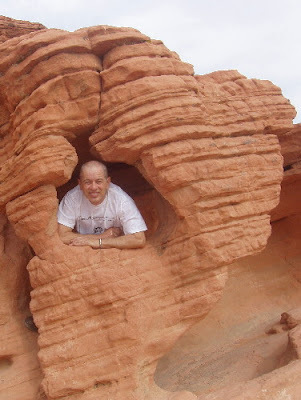 while I'm away check the blog of my Vegas buddy Darryl Grimm. he mite reflect on the neon glow of our conversation. "one of the legendary tricks"
that's how Patrick McGilligan labels Robert Seiter in his George Cukor bio. 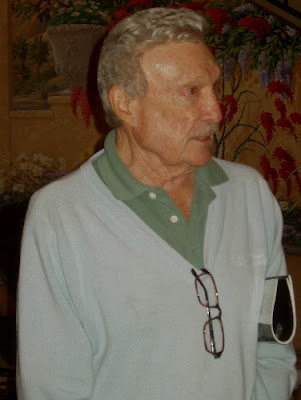 he was the brother of director William Seiter. his acting career lastd from 1925-1949. he then became a film editor &nsbp; working primarily in television. but he's best rememberd today for his looks & sexual prowess. last nite I saw Seiter -- using the name Robert Manning -- in "The Sign of the Cross" (1932). a looker indeed. McGilligan writes that after Cukor was done with the young actor Seiter took up with wealthy Alex Tiers a former Cukor roommate & pal of Gloria Swanson. other sources mention a relationship with character actor Grady Sutton. but I don't think anyone's written abt Seiter's romance with Shannon Rodgers. 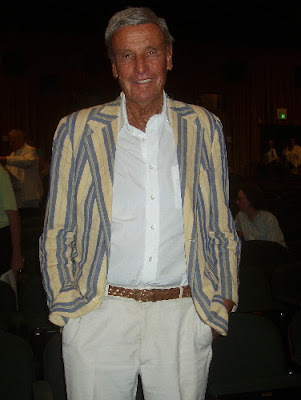 he was a costume designer at Paramount in the '30s. years later in New York he was a popular designer of women's clothes designing for Miss Americas & First Ladies. Shannon also did the gown Joan Crawford wore to Truman Capote's black & white ball. Shannon was in his late 70s when he told me abt Seiter. he seemd like a young man again remembering the beauty of his former companion. is beginning with a Donizetti confection calld "The Night Bell." it's being performd in the lovely theater at Scottish Rite Temple. the lead is well sung by Sean Anderson. abt the Palm Springs Film Noir Festival is its intimacy & its eccentricity. it's intimate because there is only one showing at a time & in the same place. 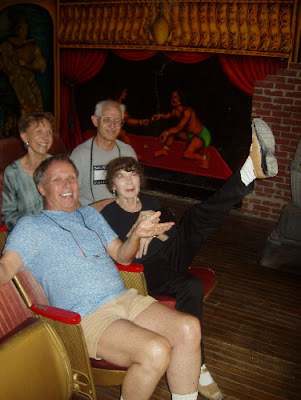 you actually get to meet people -- like Roberta & Mort who have become my filmgoing buddies. & the guests are just like everyone else. they hang out. 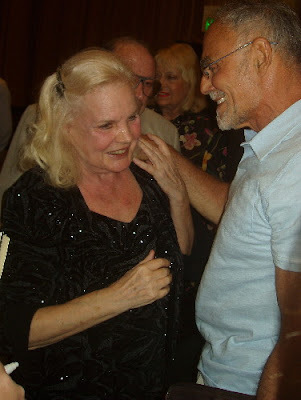 I was able to remind John Saxon abt meeting him with my mother in Cleveland a century ago. I chattd with Kathleen Hughes abt her long friendship with Marie Windsor. it's eccentric because its director Art Lyons is. I don't agree with his notion of film noir. in fact many of the films he shows aren't noir at all. but he does have an eye for the forgotten or out of the way. where else cd one see such a gem as "Port of 40 Thieves" a 1944 Poverty Row production which may be the first movie abt a female serial killer. & even when the films are less than stellar there are some wonderful moments -- like William Reynolds in drag in "No Questions Asked." & then there was "Bewitched" (no relation to the recent bomb)whose star was never seen: we only hear Audrey Totter in the first year of her film career but she still walks away with the picture.